This list was very kindly supplied by SouthamptonOldLady who has also provided the insight below. Bread, milk eggs, meat for stew – crossed out, steaks, double cream, blue eggs (trendy tinted ones? 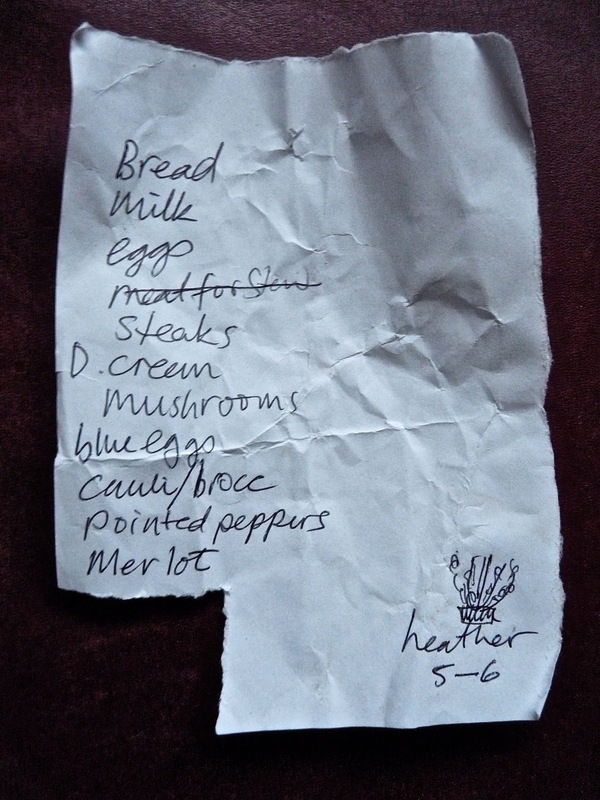 ), cauliflower or/and broccoli, pointed peppers, a bottle of Merlot wine, 5-6 pots of heather (lovingly doodled). Perhaps we can guess that this list is for a posh, romantic dinner at home for two, then a bit of gardening at the weekend. The ‘meat for stew’ has been crossed off – so perhaps at the last minute they have been informed that they will be on their own for the weekend and suddenly changed the menu?